I like making broth or stock using bones. I most often use it to form the base for the soups and stews such as oxtail stew. Homemade broths, made my simmering bones and attached tissues in water often with the addition of vinegar, vegetables and other flavoring agents, have lately become quite fashionable again among certain groups of people interested in traditional food. The flavour imparted by a good bone stock is far superior to that of a commercially bought stock cube. While there are a variety of ways of making stock, the practice of including bones and simmering for many hours is credited with forming a mineral rich stock on various sites around the web. A brief search online will uncover claims that bone broth is a rich source of calcium, magnesium, phosphorus, and potassium. However, when attempting to find the evidence for the basis of these recommendations it soon becomes apparent that very little actual scientific measurement of the mineral content of bone broths has taken place, the recommendations apparently being based on the fact that bone contains minerals and so by the process of cooking that broth should too. The first obvious place to look was the USDA National Nutrient Database, which helpfully includes an entry for “Soup, stock, beef, home-prepared”. However, the total lack of details as to the ingredients or quantities used, the cooking time or volumes of liquid added make it difficult to judge how meaningful the results are to any other homemade stock. As it happens, the nutrition listed by the USDA is rather unimpressive with a 240 gram cup of their broth containing only 19, 17 and 64 milligrams of calcium, magnesium and phosphorus respectively. The 444 mg of potassium and 457 mg of sodium are rather higher but without knowing the ingredients these could have come from added vegetables or salt. For the most comprehensive analysis of traditionally prepared bone broth, it seems we must go all the way back to the year of 1934 and a paper by two stalwarts of the early days of British nutritional science Robert McCance and Elsie Widdowson. Their paper published in the Archives of Diseases of Childhood was inspired by the use of broth as a food for young children (McCance and Widdowson 1934). They even helpfully provide a traditional recipe for this broth as used in Britain at this time. To investigate this they took some veal bones, trimmed of fat, and chopped up to expose the marrow inside. Of these bones 400 grams were each placed into four flasks and 1 litre of water added to each. To the first 3 flasks was added 1, 2 or 3 tablespoons of vinegar and the contenst boiled gently for 7 hours taking samples for analysis at 1, 2, 4 and 7 hours. To the fourth flask was added 1 tablespoon of vinegar and left unheated. The results of nitrogen and potassium are shown below. They report that the addition of vinegar made no difference to the extraction of nitrogen or potassium. You can see from the graph above that the amount of nitrogen, in this case protein in the form of gelatine, in the broth increased linearly over the 7 hours, while little was extracted at room temperature. On the other hand almost as much potassium was extracted at room temperature and pretty much all the potassium had been extracted after a couple of hours. The mineral composition of two separate broths made with just water, bones and vinegar and simmered for 7 hours are shown in the table below. The figures are given for 1 cup (240 ml) of broth as this seemed a more intuitive figure than for 100 ml. As you can see from this table the levels of minerals in a 240 ml cup of this broth was very low and as the authors point out would contribute little minerals to the overall diet. The authors of this study also measured the mineral content after vegetables had been cooked in the broth and this was a little higher but not greatly so. This apparent lack of minerals entering the broth from the bone seems disappointing. Another study from the same period reported large amounts of calcium was extracted into the sauce from traditionally cooked Chinese sweet-sour pork spareribs (Hoh et al 1933). However, the acidity of the vinegar based sauce was much greater than found in broth, even with vinegar added, which may explain the difference. A limitation of the McCance and Widdowson study was that it was limited to only seven hours, although they claim that all the minerals had been extrated in a shorter time than that. Some current recommendations call for much longer coo king times for broth, up to 24 hours in some cases. As it happens another more recent study from 1994 investigated longer cooking times, although only for calcium. 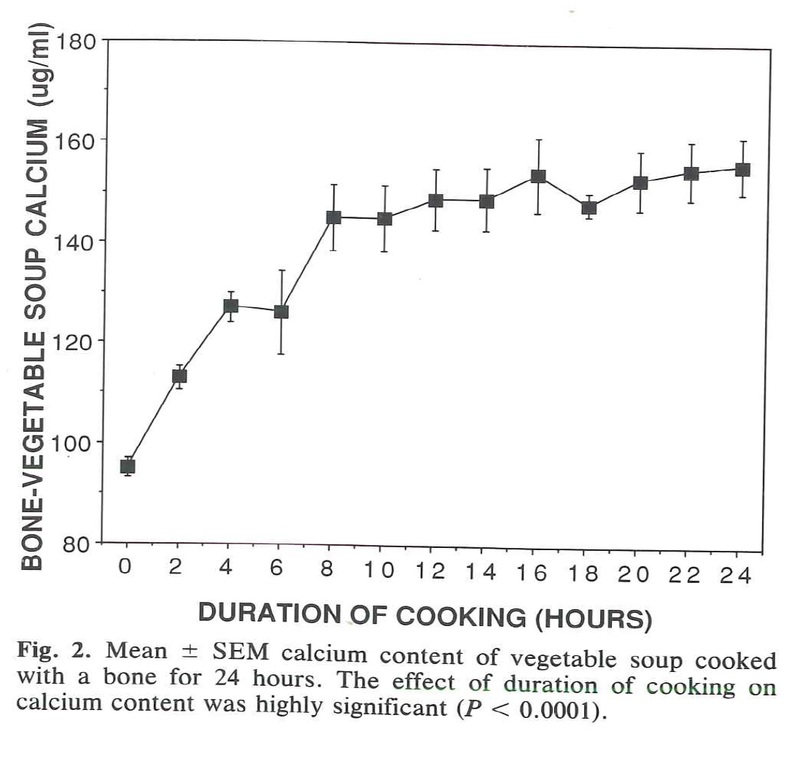 Usefully titled “Chicken soup revisited: Calcium content of soup increases with duration of cooking”, this study compared the calcium content of broth made with bone and distilled water, bone with vegetables in water and just vegetables in water (Rosen et al 1994). In this case the bone used was a neck vertebra bone from a cow that had been split lengthwise to expose the interior to the water. 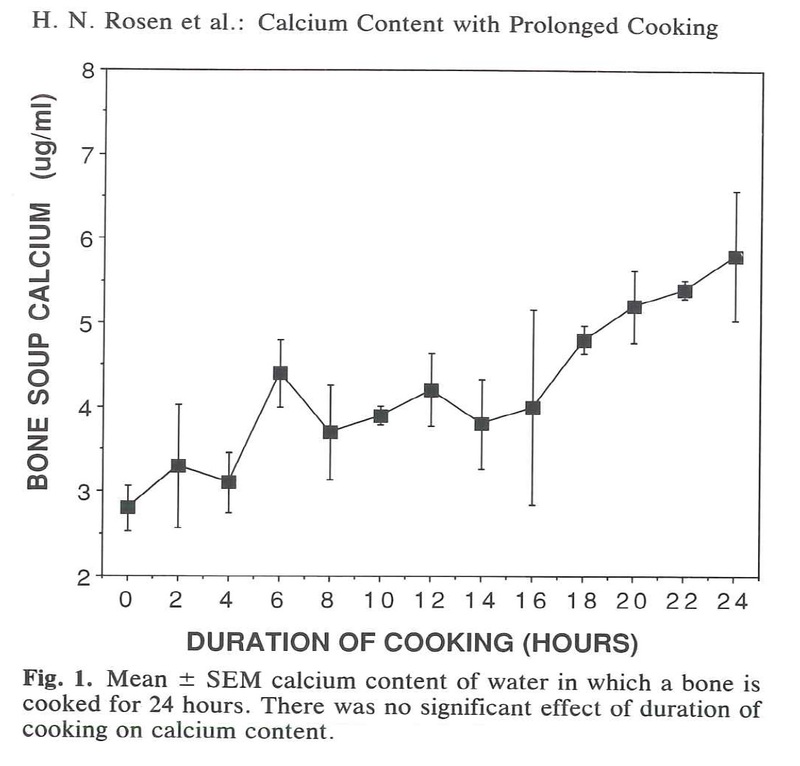 The graph below shows the change in calcium content of broth cooked with bone and distilled water for twenty-four hours. As you can see from this graph even after 24 hours cooking rather disappointingly there was almost no calcium in the water. Even after 24 hours a cup of this broth would only contain an insignificant 1.5 mg of calcium. Next these researchers cooked another bone in a broth filled with vegetables including tomato puree, onion, potato, carrots, parsnips, celery and stewed tomatoes made up to 2 liters with water. The calcium content of this broth is shown below. This time with the vegetables producing a modestly acidic pH of 4.5 the amount of calcium in the broth increased to a higher level. Most of this increase occurred in the first 8 hours of cooking. The calcium increased to 37.5 mg in a 240 ml cup of broth after 24 hours of cooking. An additional experiment showed that this increase was not due to calcium from the vegetables. While better than in the previous study this broth would not supply more than a modest amount of your daily calcium requirements. The authors mention in their discussion another study, that I cannot access, from 1989 that found that reportedly found no increase in calcium with a less acidic pH of 5.6 in their broth (Hadfield et al 1989). This is in contrast to the previously mentioned study on Chinese spare ribs that produced a very acidic pH of 3.2 in their sauce. So perhaps a level of acidity below that possible in bone broth is needed to extract a meaningful amount of calcium. These results suggest that the at first apparently very low mineral content listed by the USDA Nutrient Database may actually be accurate. In conclusion, the evidence for the amount of minerals found in traditionally made bone broth is rather limited. What evidence there is outlined here does not support the claim that bone broth is a good source of dietary minerals. Hadfield L C, Beard LP and Leonard-Green T K (1989) Calcium content of soup stocks with added vinegar. Journal of the American Diabetic Association. 89(12):1810-1. (Pubmed). 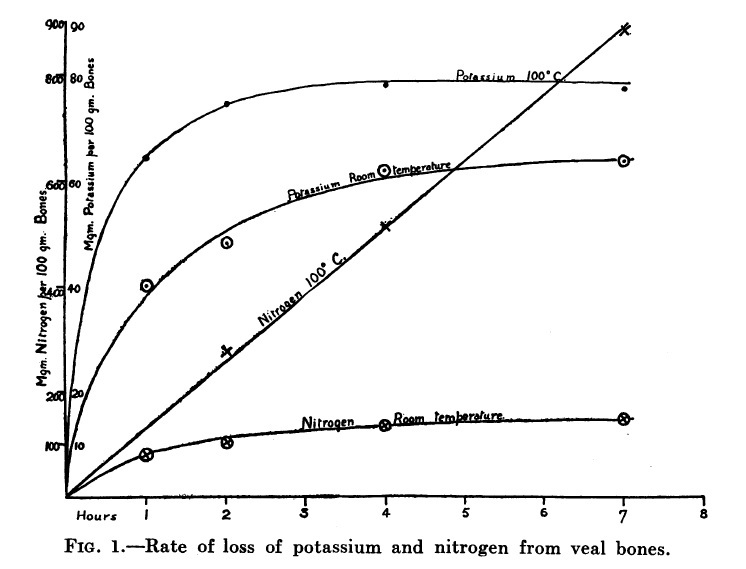 Hoh P W, Williams J C and Pease C S (1933) Possible sources of calcium and phosphorus in the Chinese diet. The Journal of Nutrition. (J Nutr). McCance R A and Widdowson E M (1934) Bone and vegetable broth. Archives of disease in childhood. 9(52): 251–258. (Pubmed). “A broth prepared from bones and mixed vegetables appears to be widely used in this country in the feeding of infants, but a search of the literature has failed to reveal any figures giving a complete analysis of such a broth. It was thought, therefore, that an investigation of its manufacture and chemical composition would form a useful study. Rosen H N, Salemme H, Zeind A J, Moses A C, Shapiro A and Greenspan S L (1994) Chicken soup revisited: Calcium content of soup increases with duration of cooking. Calcified Tissue International. 54(6):486-488. (Pubmed). From a brewing standpoint, this is not at all surprising. Frequently brewers add calcium salts to the water to increase calcium ion levels before using it to brew with. In the course of the brewing process (during the mash) these ions react with phosphates in the grain to form calcium phosphate (ie bone material). This material is extremely insoluble in water, and forms crystals and drops out of solution, decreasing the calcium ion content of the solution, even at normal mash pH of 5.2-5.6. So not only will calcium frequently not be extracted into aqueous solutions, given the opportunity it will actually react and remove itself. The better source of calcium in most soups is likely the meat itself, where ionic calcium (not bound to a phosphate) is needed for normal cellular function. Modest amounts of calcium can be added to broths by replacing some of the sodium chloride (table salt), with food grade calcium chloride (a salt of calcium), but its likely not worth the trouble. Hi Dennis, thank you for your comment. That is very interesting about the fate of the calcium salts used in brewing as it is not something I am familiar with. Often statements related to nutrition, like the mineral content of broths, are repeated over and over without anyone really thinking about how realistic they are. Really? No one has looked at the mineral content of broth since the 1930s?! Yee gads. Broth is likely worth it just for the different amino acid profile, but it sure would be nice if someone could do a nutrition analysis with modern tech! I’ll keep making it for the gelatin and the flavour. I was surprised that there had been no more recent analysis. I start with a 2kg of necks, I put them in a 10L pot with water (main pot). To that I add 1 clove of garlic, 1 large chunk of ginger and 3 onions, all blended. With the lid on cook on the hottest heat available for a few hours. At this point put a second pot (reducing pot) on the stove at a mid-heat and strain half the liquid from the main pot into the second pot. Any chunks in the strainer go back into the main pot. Top the main pot back up with boiling water and replace the lid. Leave the lid off the reducing pot to allow it to, well, reduce. Every hour or so strain more liquid from the main pot into the reducing pot. If it starts slowing down or is getting thin add more garlic/ginger/onion. After maybe 8 hours there will be very little solids left in the main pot (it will be sludge) and the reducing pot will have a super-rich stock. Hi Heath. Thank you for your comment. That is an interesting method. Each fresh addition of water could dissolve a little more of the calcium. But the calcium phosphate in the bone is not very easy to dissolve in water so I suspect there might be calcium remaining in the sludge at the bottom of the pan. In the cookbook Nourishing Traditions by Sally Fallon I believe she recommends baking the bones first and then boiling them. Maybe this technique would encourage the dissolving of the minerals. Thank you immensely Matthew for the excellent research and narrative, which responsibly identifies truth in fact. It is disturbing how the false prophecy of bone broth soup being a viable calcium source is parroted without discernment. At our sustainable farm we experimented with boiling pre-baked chicken bones over 40 hours in a citric acid solution in an effort to bring about dissolution of the bones so as to produce a genuinely calcium rich broth. The effort was unsuccessful in dissolving the bones. We later succeeded in softening bones through 20 hours of baking in a solar oven at 350F, but the extensively baked bones are extremely unpalatable in terms of flavor when subsequently boiled in a broth. We continue to experiment, with determination to succeed, in converting bone calcium to a bio-available consumable food item. Wow, super interesting. Thanks for digging up this research. I wonder if someone will take the time to study broth cooked for longer periods. I have a recipe that recommends cooking up to 72 hours. I’ve made it several times, and around 48 hours, it becomes MUCH, MUCH richer. I never let it go past 60, though, because it seems at that point it becomes unpalatable. Still, I wonder what is happening chemically with that dramatic change after the first two days. Do you know if the new McCance and Widdowson contains nutrient analysis data for bone stock/broth? I think it came out a couple of months ago but I have not got my hands on one yet. Pingback: The Great Bone Broth Experiment | Real. Fresh. Paleo. From a health perspective isn’t bone broth all about the amino acid and gelatine content to assist in gut and wound healing? minerals would of course be an added bonus. I’m coming from a different angle. When I see boxed bone stock on the shelf I want a way to prove it is authentic (is from bones) but there is little written evidence on the package. I was hoping to use the RDA of calcium to support that the stock came from bones but time and again the manufacturers of stock all put 0% calcium on the product. The USDA database you linked says 19 mg calcium per cup of beef stock and that should be 1% of the RDA not zero. The 1934 article says 10 mg calcium per 100 gm bone which is compatible with the USDA in the sense that both should show up as 1% RDA of calcium. What about the bioavailability of the mineral content? Might it be possible that the amount is not as important as this? For food/nutrient logging, e.g. MyFitnessPal, dose anyone have the actual FULL nutritional values for chicken broth/collagen (gel alone, from feet, and values for other parts separate), we get in the pot ? i.e. home made if possible or whatever values you have. USDA food database is normally good, but nothing there on collagen values to use ! This was super interesting! Thanks for the thorough research. I have always thought bone broth is very rich in minerals, but obviously not. What a disappointment… but I still consume it because of gelatin and because it makes a great base for tasty soups!